An elegant period production that used operatic music exclusively for transitions. The sometimes jarring vocal lines actually complimented the debased nature of the storyline. 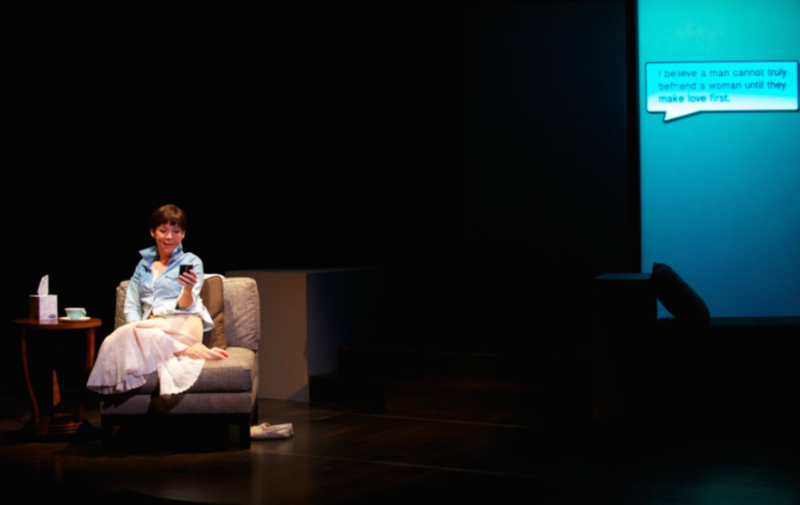 The director desired a significant "breaking of frame" for the curtain call that would emphasize the unreal nature of a theatre production. I chose to create a mash-up of the classic Joy Division song, Love Will Tear Us Apart, combining an orchestral version with an indie-pop version. Very minimal sound elements for this one woman tour-de-force biography of Emily Dickinson. Preshow music and curtain call. The fewer the cues, the more important it is to get it right. I created the sound and video for this projection heavy film-noir style detective story. The entire artistic staff was made up of my colleagues from UWM. We had a great experience working together for the first time off-camps after many years of educational theatre. 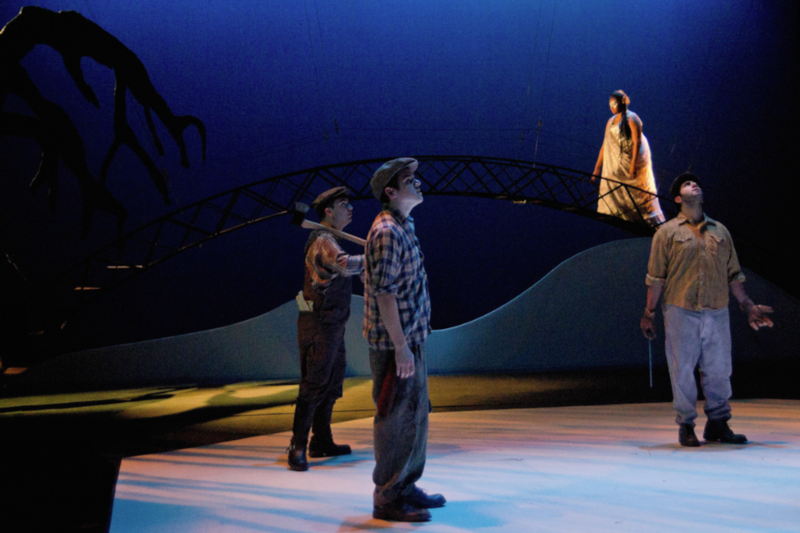 With such close access to each other, the design elements were particularly cohesive and it remains one of my favorite productions not only to have worked on but seen performed. Unlike my next sound & video project, The Congo Code, The soundscape was mostly independent of the video due to the limitations of the delivery systems. Camera shutters, runaway computer printers and cell phone rings were the order of the day. The final moments of the play called for some type of ambient punctuation. I created a bit of open ended tonal ambience complete with wind, chimes and human breathing. 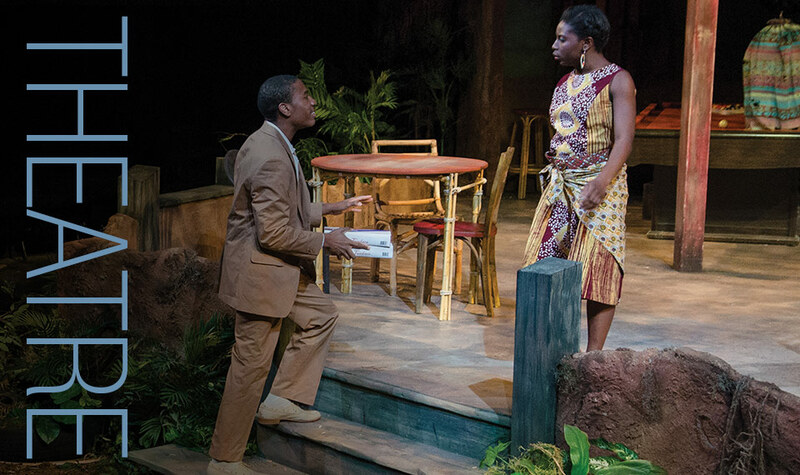 Set in the Congolese jungle, this production featured a huge environmental soundscape. 20 discreet speaker locations, some placed within the audience seating area were used to pipe in up to 40 individual tracks of bonobos, parrots, insects and many other sounds of wildlife and weather found in that part of the world. Gunfire , explosions and electrical generator failure played against this backdrop, creating an immersive experience. And there was that talking parrot. Voiced by an actor, treated and mixed with actual parrot vocalizations, the effect was focused at an on stage bird and birdcage prop using a strategically placed speaker. After the bride runs off with an outsider the families endure a surreal dreamlike chase/witchhunt in order to collect her. The entire sequence was scored with a tonal ambient soundscape I created - see below for a shortened version. It features synthesizer drones, treated violins, treated vocalizations, blood curdling screams (provided by the actors) and the best witch cackle ever (courtesy of director Sheri Williams Pannel). It remains one of the favorite ambient pieces I've composed.